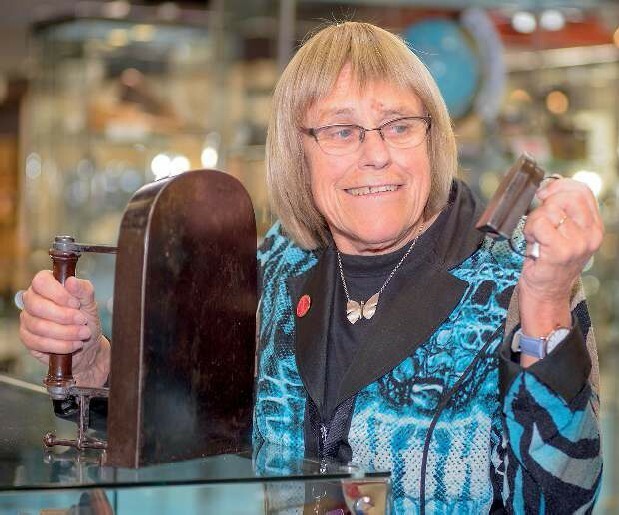 In the latest of our occasional series of collector interviews, we talk to Penny Savill who collects irons, buttonhooks and jigsaw puzzles. She recently co-ordinated Pressing Matters, a display of irons presented by members of the British Iron Collectors group at the Art & Antiques for Everyone Fair at the NEC in November. ATG: What kind of irons do you own? Penny Savill: With my husband, Harry, I collect laundry irons across the board. Everything from tiny lace irons to heavy, commercial tailors’ irons; glass slickenstones (used cold) to 20th century electric irons; solid cast flat irons to intricate crimping machines. ATG: When did you start collecting? In 1980, I moved into the house in which I still live and found a heavy old iron in the attic. Then we found some irons in a nearby farm that ran a second-hand furniture business. We had to push of the hens and wipe away some muck and feathers, but we took a couple of irons home and when one became three of a kind, a collection was born. ATG: How did you broaden your knowledge of your collecting area? Keen to learn more, I went to an exhibition of irons at Bath University and contacted the owner. We met at Bath market and I had a new interest and a new friend. This led to many new friends and, with their help and encouragement, my knowledge and my collection both grew. ATG: What is your most exciting find? Probably our most unusual find is a pleating iron patented in 1928 by Hamilton and Sutton. Unused, in a box, it cost £12 in a weekly market. It is square nosed, has a number of detachable plates that slide into the nose and probably would never have worked as it should. ATG: What is the strangest place that you have acquired an iron? Years ago, we spent one night in a Dayak longhouse in Borneo. We were sitting in a small group having a discussion with an interpreter and I asked: “Do you have any old irons, here, please?” I was told they had, and we could see them in the morning. The next day the chief appeared in a loin cloth, carrying a blowpipe and a bag. He extracted a rusty old charcoal iron and we had to politely decline it. Then he produced a superb Butterly petrol iron, the likes of which we have never seen before or since. Primitive he may have appeared, but he was no fool – we paid a lot for that iron. It was worth every ringgit, though, especially as I was photographed receiving it from the chief. ATG: Where else have you sourced irons? I spent holidays in Vienna and every Saturday I crept out of the house early in the morning and made my way to the Naschmarkt (lea market). I found irons galore there, and heaters, with an average price of about £3, and would struggle back to the house weighed down. I flew home with my allowed weight and left the rest for my sister to bring back with the car to England. A pleating iron patented in 1928 by Hamilton and Sutton from Penny Savill's collection.. It is square nosed and has detachable plates that slide into the nose. ATG: What is one of your most memorable purchases? We were moving from Kyoto to Tokyo when we visited a local lea market. It was taking place in temple grounds – some people were arriving to pray, others hunting for bargains. We wandered around and came to a long stall and there – right in the middle, in holy temple grounds – was a water iron that looked a bit like a kettle and resembled no other iron at all. Frantically I rushed to the end of the stall, across to the shelf and grabbed it before anyone else could take it. I love it! ATG: A rule to live by? Never give up looking – the hunt is as good as the find. ATG: Who makes up the iron-collecting community? Iron collectors are from all walks of life and all are represented in British Iron Collectors. There is a strong international community and British collectors have close bonds with others from many European countries as well as the US, Australia and New Zealand. ATG: How has the market changed since you’ve been collecting? available and collections soon built up with good material. 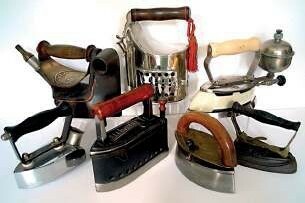 Today fewer irons are appearing on the market unless a collector disposes of his/her collection and has a specialist auction. There is almost no market at all for many irons. Only rare ones are really attracting any interest. Even then, the market is unpredictable, and prices fluctuate. ATG: Where do you prefer to buy – shops, fairs or online? We attend many of the large antique fairs, enjoy lea markets and car boot sales and I have bought at meetings of iron collectors. Buying irons online is difficult because you really need to examine a piece and, of course, there are hefty postal charges for such heavy items.